The Kabin-Pak HE K120HE Regular Oil Boiler is a condensing unit that has many features and benefits. Designed and manufactured by Warmflow, this boiler is highly efficient and that’s shown through it s efficiency rating of 93% which means it has an ErP A rating. With an output rating of 33kW, this boiler is perfectly suited to larger homes that have a high demand for heating and hot water. It’s also available in a range of other outputs from 15-44kW, which means there’s a unit to suit smaller homes right up to larger properties. Despite being a compact unit, it has a lot of features such as one IE320 mains socket that is supplied and wired on site, factory fitted with a 3-bar pressure relief valve and auto air-vent as standard and a multi-optional low level flue that can be positioned to exhaust from the back, left or right-hand side of the casing. Housed within an anthracite grey casing, it has front servicing and is suitable for use with conventional flues or multi-optional HE ‘Easy Fit’ Balanced Flue System and a Riello RDB2.2 and 3.3 burners are fitted as standard. You’re also given the options of including a frost protection thermostat kit that protects the boiler from freezing over in the cold winter months when you need it the most, and you can also have it pre-wired or pre-pumped. As a Regular boiler, it heats your central heating system directly and also produces hot water for your cylinder, which is often fed by a cold water storage cistern located in the loft, so this boiler isn’t suited to smaller homes or properties where space is limited. 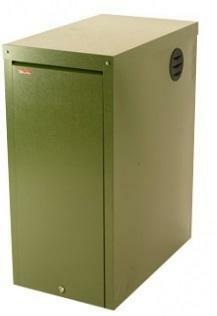 Available with a 5 year warranty, you can install this boiler safe in the knowledge that you’ll be able to rely on it.